In 2001, the Town of Craik and the Rural Municipality of Craik began working in partnership to develop a long-term plan for a sustainable community-based project. This partnership, called the Craik Sustainable Living Project (CSLP) recognizes the need for tangible, local initiatives addressing climate change and rural community revitalization. To build upon the relationship between the CSLP and local people. The Eco-Centre, completed in 2004, is a key component of the CSLP. It features innovative and energy-efficient building design; integrated heating, cooling and renewable energy systems; as well as renewable waste handling and water treatment systems. Enhance the “curb appeal” of the Eco-Centre. 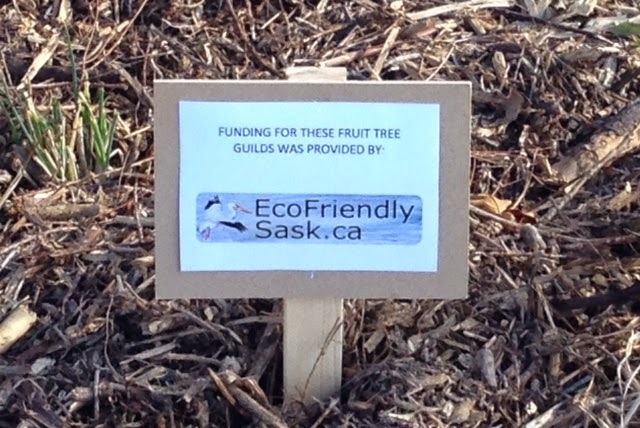 During September 2014, community volunteers completed the planting project as proposed at the Craik Eco-Centre. In each of the three beds, they planted an apple tree (2 species represented), a haskap, a sour cherry, a cherry plum, 3 comfrey plants, and 3 chive plants. Other plants such as lupines will be planted in the spring of 2015. The beds were watered well and heavily mulched. This permaculture-based “guild” arrangement is intended to demonstrate plant diversity, companion planting, and food production potential.